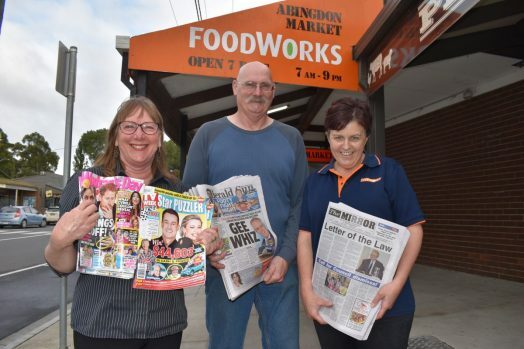 • Hear all about it: Henny Hather, Geoff ‘Dog’ Sparkes and Katherine Finn can’t wait for the move across the road to the Foodworks Supermarket. THE Foster Newsagency is ready to move its stock to the Foodworks Supermarket, meaning the creation of a business that will be many things to many different people. The date of the big opening? Monday, April 1. But according to news agency manager Katherine Finn, the April Fools’ Day date should not be considered a joke. This story is for real. Months and months of planning have gone into the move. The main benefit will be that customers will be able to buy The Mirrorand many of their other favourites up until 8pm, including weekends. Husband Gerald Finn, the public face of the supermarket, will continue to run the grocery side of things. “We’ve been making the move afterhours. We think it’s going to be much easier for our customers, especially our older regulars,” Katherine said. “People will be able to grab all the stuff they want in the one place. They can get their papers as well as their groceries. They’ll also be able to shop later, which is more convenient. They’ll be able to come here until 8pm and buy a paper or a magazine, or a card, or any other stationery.